DarkLegends | Imperial Archive » About Us? What you guys seeing above is the past members of DarkLegends when it was still active and was at its peak something around 2011-2012 before DMCA/SOPA/PIPA those things hit us. It was really hard at first it hit us, we were down for quite some time until the site was rebuild again. It was really hard at first it hit us, we were down for quite some time until the site was rebuild again. I did join at around 2011, took some project despite my “overpowered” Atom netbook. **discreet cough** Ehm, please excuse the above pranks of our resident troll Zerohunter. We’re in dire need of more encoders by the way. Please feel free to audition on the chat and join our little community. For audition: encode any anime episode and leave it at the Receptionist’s desk (lol…I mean PM it) or leave the link in the comment section below. The Encoders will examine your encode, and decide whether the quality meets our standards. If not, then the mistakes will be pointed out and how to correct them, you can keep trying and learn. For Learning encoding, refer to this guide. Any other questions you may direct them to our encoders on the chat. You will be required to register for a username in Chatango, so you can join us in our conversations, ask us questions and PM us. You are always welcome. We’re looking forward to meeting our future encoders. On July 8 2013, the No.1 Admin of Darklegends John2born wrote a farewell letter before retiring and closing down the site. Darklegends was soon after revived by Kuroko1710, one of the latest encoders to join at the time. It was this site’s predecessor and lasted almost 2 and a half years. Here is John2born’s farewell. I remember reading this not too long after finding Darklegends. You can view a pic of the site back then here (for reading the comments…wow, DL had a lot of fans). Sorry to say this guys.. but i wont be able to continue any longer.. my real life needs more attention these days.. and as ya may see my encodes ar delayed 2 or 3 days… Im not able to spend time with ya guys.. and its time I lay down my encoding for good like the others…. I love ya guys a lot.. and i hate to give up on the site.. but its time i let go what i love the most in order to grow up. So from this day i Quit encoding .. but the site will be available till last of June…. as my parting gift im gonna share the direct DDL links from the seedbox server.. so that you people can download the old encodes with ease. 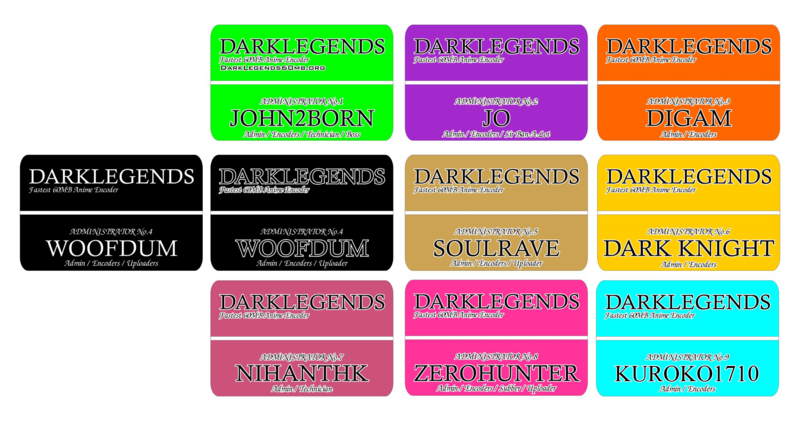 And please guys after reading this post.. dost ask me to continue the site… Cos I will not be able to do that… Finally i would like to thank all the fans who supported DarkLegends for all these days and Thanks to all the staffs who made DarkLegends a great success.. ! !